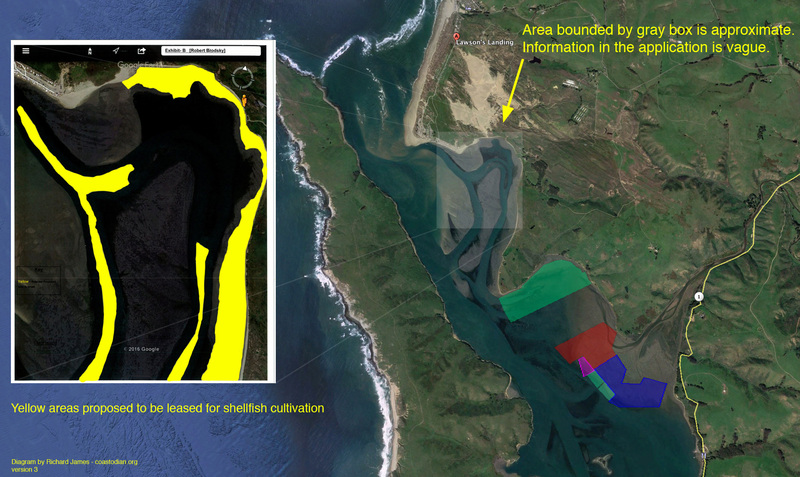 Click on the words above “New Application to cultivate Shellfish in Tomales Bay” to see this entire post. On Thursday February 9th at a regular meeting of the California Fish & Game Commission (CFGC) in Rohnert Park, the CFGC received an application from Robert Brodsky and his company, San Andreas Shellfish. The application is to lease, from the public trust, approximately 45 acres of state water bottoms for the cultivation of shellfish within Tomales Bay. The application may be viewed here. Below you can see one of the maps from the application that shows the area the application wishes to lease in bright yellow, superimposed upon a photograph of the area from above. The general area up for consideration in the lease is the eastern portion of the bay between Tom’s Point and Lawson’s Landing. The species which Mr. Brodsky would like to be able to cultivate are: Pacific Oyster, Atlantic Oyster, Kumamoto Oyster, Mediterranean Mussels, Goeduck Clam and Purple Hinged Scallop. If granted, the lease could be a maximum of 25 years, per Fish and Game Code 15405. Once the evaluation is complete, the CDFW will provide a recommendation to the Commission. 2 CFGC will place the item on the agenda of the next CFGC meeting. The public will be able to comment on the item at this time regarding public interest. If the CFGC determines that the area applied for is available for lease and that the lease would be in the public interest, CFGC shall publish a notice that the area is being considered for leasing. No aquaculture lease for state water bottoms will be approved until the Commission has held a public hearing at least 90 days after notice thereof has been published in a newspaper of general circulation within the county involved. In addition, California requires state and local agencies to perform environmental impact analyses when granting permits. Potential environmental impacts are addressed primarily through the California Environmental Quality Act (CEQA) review of the proposed facility. Although not a permit, CEQA compliance is mandatory for state, local, and other agencies subject to the jurisdiction of California to evaluate the environmental implications of their actions. 3 Place the item on the agenda of a CFGC meeting where the Public may comment on the CEQA evaluation and final approval of the lease. At this time, the CFGC will make a decision on whether to certify the CEQA document and whether to approve the lease. Should a lease be approved, the applicant will also need a variety of permits and other authorizations, including from the Coastal Commission and U.S. Army Corps of Engineers. Read the next related post on this topic here.